Dalai Lama: Tibetans maintain mental strength and keep strong hold on Tibetan identity. Arriving early Saturday morning at the Klagenfurt Hall in Salzburg, Austria, His Holiness addressed the community of approximately 350 Tibetans, mostly residents of Austria and Switzerland, who had gathered to meet him. He began by telling them, "We Tibetans, wherever we are, maintain our mental strength and keep a strong hold on our Tibetan identity as we need to do. In addition, we should always remember the Tibetans in Tibet and their strong determination too. They have no fear for themselves, but are devoted to the cause of Tibet." He remarked that prior to 1959, while there were spiritual links throughout Tibet, political unity was much weaker. However, due to the Chinese occupation, Tibetans now have a strong solidarity with each other. The robust sense of Tibetan identity that now prevails in Tibet and its bordering areas owes a great deal to the distinct spoken and written Tibetan language. This is something of which Tibetans can be proud. Tibetan literature contains, for example, profound explanations of the mind and its functions, because of which Tibetans can think of Tibetan Buddhism and its culture having a valued role in the world. Tibetan culture is also distinguished by its use of logic and epistemology to sharpen the mind. Although Buddhism came to China earlier than to Tibet, the Chinese do not have the breadth of books on philosophy that are found in Tibet. His Holiness spoke of how Tibetan Buddhist culture is characterized by kindness and compassion for others. He recounted the story of a Tibetan he met in the United States, who had worked in a vegetable processing factory. 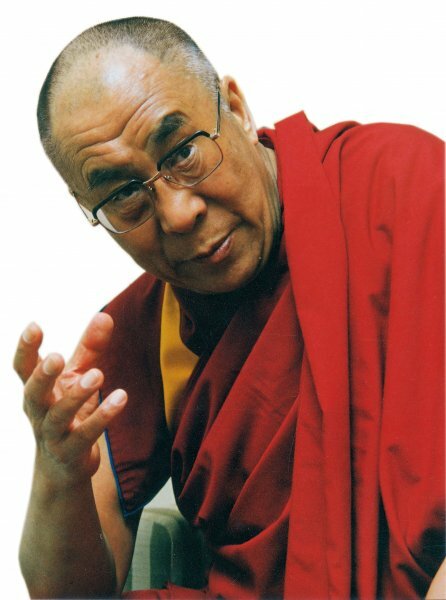 He told His Holiness that whenever he could, he would rescue insects he found in the vegetables, set them aside and later release them outside. His co-workers asked what he was doing and after he had explained Tibetan culture's reverence for all living beings, they gradually began to do the same. "We say the Chinese are destroying our culture, but it'd be contradictory if we, who live in free countries, did nothing to preserve it," His Holiness said. He explained that an important way to preserve the culture is to make sure young Tibetans can speak, read and write in their own language. The deliberate suppression of the Tibetan language by the Chinese authorities reaffirms the Chinese understanding of the importance of the Tibetan language. This preservation of the Tibetan identity called for an urgency to establish Tibetan schools soon after Tibetans first arrived in India. Regarding his devolution of political authority to the elected leadership last year, His Holiness made clear that it was not a new idea. As early as 1951 and 1952, he had attempted to introduce such reforms in Tibet, but was obstructed by the Chinese who wanted to reform in their own way. Since the election of Tibetan leaders in 2001, His Holiness has been semi-retired, so he was proud last year, with Samdhong Rinpoche beside him, to hand the Seal of the Tibetan Government that he had received at the age of 16 from Tagtrag Rinpoche to Kalon Tripa, Lobsang Sangay. He said, "Our democratic system has two purposes: to ensure the future of the Tibetan cause, but also to show the Chinese what we can do." He pointed out that the Ganden Phodrang had existed as the Office of the Dalai Lamas before becoming the government of Tibet and that he had now restored it to its former status. His final advice to the assembled Tibetans was, "Have a happy mind."